Levi Seth of Australia's site Sticks For Stones recently conducted an interview with legendary bassist/vocalist Glenn Hughes (DEEP PURPLE, BLACK SABBATH, BLACK COUNTRY COMMUNION). You can listen to the entire interview below. A few excerpts follow (transcribed by BLABBERMOUTH.NET). Glenn: "I'm always talking to the children of the parents, like your mom and dad, it's really a gas for me because I've been doing this for so damn long, but it's always great when parents pass on the torch to their children. It's an honor for me." Glenn: "[Laughs] I've got my mother's skin. I've been clean and sober a long time. I'm a workout enthusiast. I do take care of my outer body and it's the inner body that is the most important, the inner self and the higher self, without me going on a spiritual tirade here. I think that we're all humans who are given gifts. Let's just say the gift I was given all those years ago, I didn't realize I had the gift, the voice, the music, the emotional thing that people hear when I do my work. And, I'm just honored that I'm still here on my two feet, still doing what my higher-power gave me to do all those years ago." Glenn: "You know, when you're young, when you're in your early 20s and back in the days when people were drinking and carrying on and stuff, I can fine-tune bits and pieces of music I've recorded back in the dark days. I can fine-tune and go, 'Oh, cool.' I can hear that maybe something was going on that day or there's some sensitivity on this song or may have been something going on with that track. I don't go out of my way to listen for those moments, but I can also hear the sobriety, if you will, and the organic-ness of my work. When I got clean and sober all those years ago, I was told by people around me that I would go on to write better songs and I'd go on to sing better or learn my craft more and have the ability to understand more about where I was going. I'm humbled by the gift that has been freely given to me. My purpose is to give that gift back to people who need to hear it. You won't be talking to a more grateful man than me this year, I promise you that." Glenn: "The writing was pretty much done, we group-wrote most of it, but some of it was written… 'Burn' was pretty much a band effort. 'Stormbringer', Ritchie [Blackmore, guitar] didn't write so much. That's when he was halfway through the album, that's when he started to think about RAINBOW. Then when 'Come Taste The Band' came out with Tommy [Bolin, guitar] it was stuff written by me and him or him and David [Coverdale, vocals, keyboards] so all three albums are completely different in genres of what rock music was for DEEP PURPLE. 'Burn' was more of a classic rock album. 'Stormbringer' was a classic rock album with a lot of groove and soul. And 'Come Taste The Band' was across the board, was pretty much everywhere." Glenn: "Yeah, it's coming September 22. We recorded it earlier this year. Joe [Bonamassa, guitar] and I wrote the album in my home last October, just the two of us. It's the first time we ever written completely alone. It's been a really great experience to do album number four with [producer] Kevin Shirley and with Jason Bonham [drums] and Derek Sherinian [keyboards] and Joe, who are my brothers. We are a family. I'm really excited for people to hear it." Glenn: "The story is, I just happened to be in New York City last April of 2016 getting inducted into the Rock And Roll Hall Of Fame with DEEP PURPLE and Joe calls me up to congratulate me. And I was, like, 'Oh, that was really sweet of you, Joe. Thank you so much.' He said 'When you get back to L.A., do you want to have some dinner?' I said, 'Sure!' So we had dinner in Santa Monica and we started talking about stuff and he said to me, 'How would you feel about doing another album with the band?' I said, 'I think that would be great!' I said, 'I've got one burning desire and that burning desire is if we're going to make a record, it has to be an epic piece of work.' Joe and I went about writing these songs… Joe came to my home on the first three albums, he came to my house like six times for the whole first three albums. When he came to do number four with me, he stayed at my home eleven days and nights. I've never seen him so excited about recording an album with BCC before. Joe and I took it upon ourselves to go deep and make sure this album was a special record." 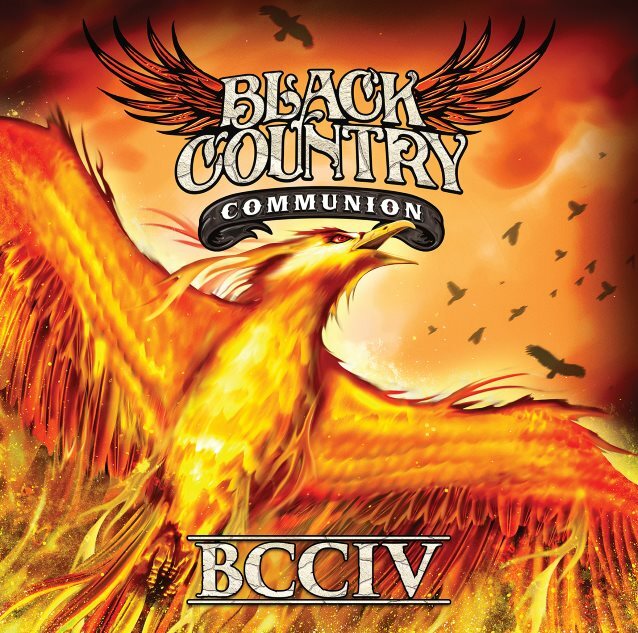 "BCCIV" will be released on September 22 via Mascot Records. 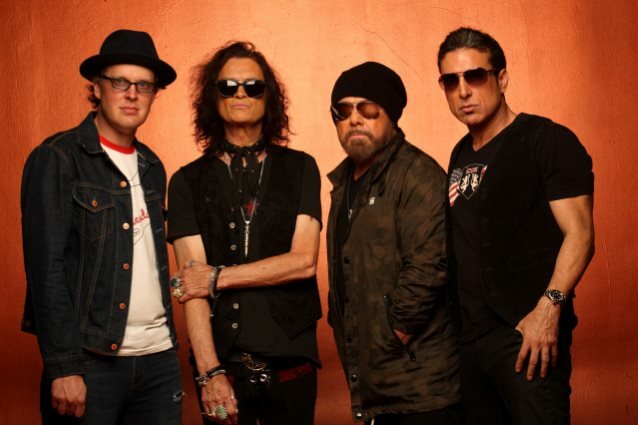 This is BLACK COUNTRY COMMUNION's first studio album since 2013's "Afterglow".